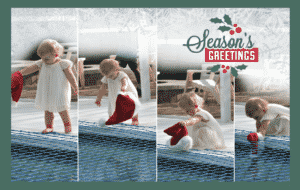 Clearly the open mesh of a pool safety net is there not to deter a child’s movement but for the easier stuffing of a Santa hat – silly us! Child Pool Safety Barriers Repurposed! W.C. Fields is famous for his credited quote “Never work with animals or children,” well for us working in child pool safety that’s our job – and we love that our pool safety barriers help parents to keep their little ones safe around open water. However, it can be a little tough working with these unconventional, determined pre-schoolers on advertising campaigns. Every year our Katchakid marketing department carefully plans out the storyboards for each special day marking out the seasons of our year. Planned images and videos of toddlers cute smiley faces eating Halloween candy and adorable little cherubs in Santa hats perched atop pool covers or feet safely planted behind pool fences are conceived to illustrate how important it is to remember child pool safety over special events and holidays when we as adults are all too often distracted. The wonderful Olivia has pretty toes she would like us to see, while Beau just has an itch! Every year these little rascals with their own ideas make us abandon our carefully designed campaigns while we snap despairingly away with our camera’s, desperately hoping that we will have something salvageable and usable at the end of this photo shoot coup. The Internet is full of memes, video clips and images of children being hilariously unique and independent, so I don’t know why we are so surprised as we toss our storyboards away and follow our new mini, maverick directors new take as to how this show should really be run! Rowan has other ideas for his candy! Find out which barrier is right for you.